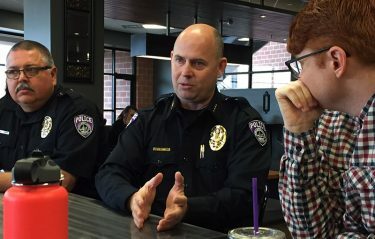 GCU Police Chief Kenny Laird, center, chats with students at Coffee with a Cop. Laird is laughing with Malachi Votaw, across the table, Officer Matt Barnett (left) and resident director James Rowher (right). 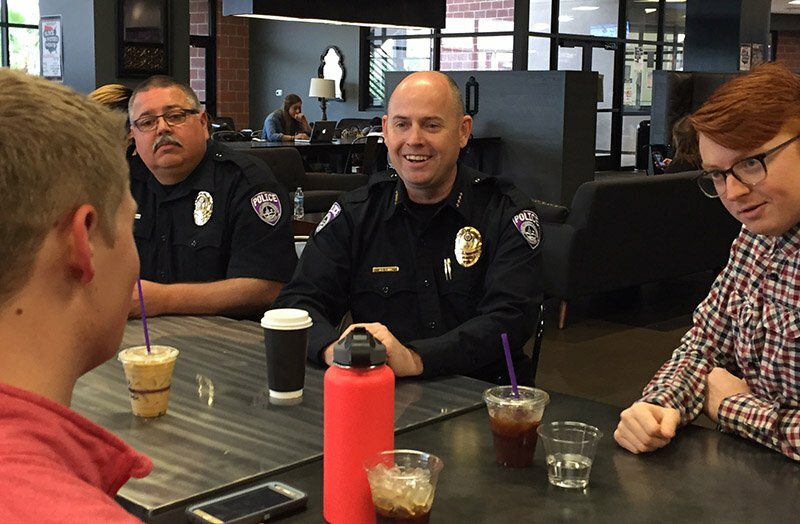 The dozen or so students who mingled with Grand Canyon University police officers during the recent Coffee with a Cop at Grand Canyon Beverage Company were clearly intrigued by their companions. They asked questions ranging from how many officers are on GCU’s police department (160 non-sworn safety and 30 sworn police, full-time) to whether they have encountered racial tensions here (the answer is no). For the most part, the students and police who gathered on the second floor of the Student Union on Friday were engaged in lively conversation sprinkled with laughter. It was exactly what GCU Police Chief Kenny Laird wanted. Laird, center, answers another question at Coffee with a Cop. It helped that Laird and the officers accompanying him, Ryan Sand, David Chambers and Matt Barnett, have friendly faces and sincerely enjoy talking with people. The idea is for police to get to know the community on a more personal basis and for students to feel more comfortable chatting with police. As the hour passed, an increasing number of students wandered over, coffee cups in hand. Laird said that he helped organize similar events in the Cactus Precinct during his 25-year Phoenix Police Department career. The neighborhood Coffee with a Cop grew from four attendees to about 1,000 over six months and continues today. Q. What is the difference between GCU police and campus safety officers? — from James Rohwer, residential director. A. Campus safety officers are the first-responders to living quarters in non emergencies, Laird said. GCU police officers can conduct investigations and make arrests. Q. What shifts do police work? — from Jacob Layfield, residence assistant. A. Three shifts, said Barnett: 9 p.m.-7 a.m., 2 p.m.-midnight and 6 a.m.-4 p.m, 24 hours a day. Q. Do you experience hostility on campus? — Layfield. For anyone who missed it, there will be Coffee with a Cop event scheduled monthly. All are welcome and encouraged to attend.